I have the sweetest husband in the world! One thing that I love about him is his unwavering support of my kitchen dreams. Recently I was watching the Food Network and one of the FN Stars used a curly fry cutter on their show! I was instantly obsessed with wanting one, and did all but beg for it. However, my husband wasn't biting. Then, on Tuesday, a package came in the mail. Low and behold that lovely man had ordered me the cutter! You know that we HAD to have curly fries that very night! They were so easy and DELICIOUS! I can't wait to share with you how I did it! To begin, place a deep skillet with 2 inches of oil over medium/high heat, and allow to get hot. salt, and pepper in a mixing bowl. Next add the beer or seltzer water. Your batter will look a little something like this. Place the potato on the cutter. Place the lid on, and turn! Next, you will place the curly fries into the batter. You will need to do this in batches. I do not have a fancy thermometer. wooden spoon in the grease and it sizzles. Let the fries cook for 6-8 minutes. and place on a baking sheet lined with paper towels. And Viola! There you have it! 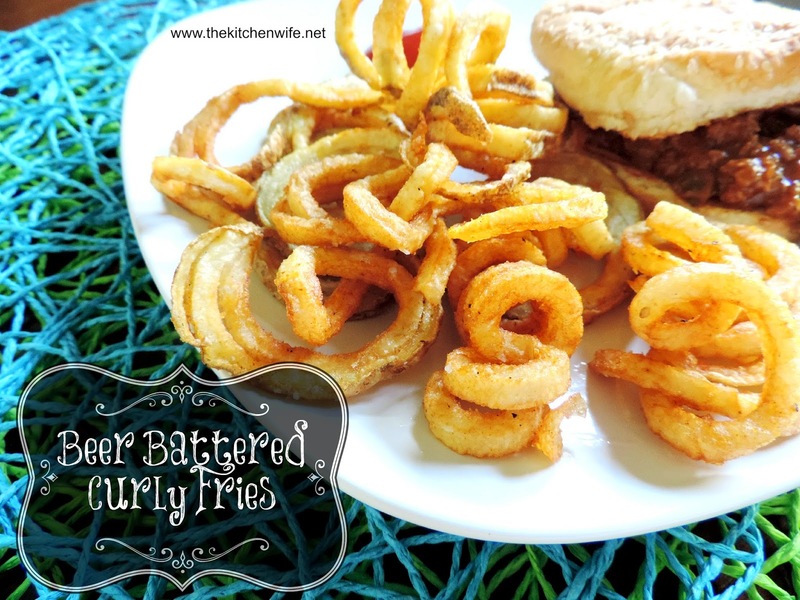 Crispy, golden brown, and DELICIOUS homemade, beer battered curly fries! These are so easy and would make a fun side for any weeknight meal! I can't help, but to think that letting the kids cut the fries would be a great way to get them in the kitchen! SO MANY POSSIBILITIES! You can purchase this curly fry cutter HERE, or Google them and choose your own! Either way, I think this would make a great addition to your kitchen artillery! Place a deep skillet over a medium/high heat with 2 inches of oil. In a mixing bowl, combine the onion powder, garlic powder, paprika, chipotle powder, salt, and pepper. Add the beer or seltzer water. Place potato in the cutter and cut the curly fries. In two batches, add the fries to the batter. Separate the curls, and add to the hot oil. Allow the fries to cook for 6-8 minutes. Remove from oil using tongs, slotted spoon or spider. Place on baking sheet lined with paper towel.